Defend the castle from dragons and invading armies with our Inflatable Medieval Swords! These 30-inch blow up medieval swords are perfect for pretend play and the kids are sure to spend hours have imaginary duels as they challenge their enemies to harmless duels over fair maidens and imagined slights. A guaranteed hit as a party favor, these medieval sword inflatables are perfect for any birthday party, no matter the ages of the children! Or, stock your vending cart with plenty of blow up medieval swords before hitting the next big event where the kids will be gathering. 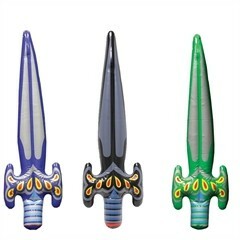 These medieval sword inflatables are a surefire crowd pleaser at any event! Priced per sword.